This volume is an album of texts and graphic material organized around computus (literally, “computation”), the medieval science of reckoning time and fixing the dates of ecclesiastical feasts, particularly Easter. 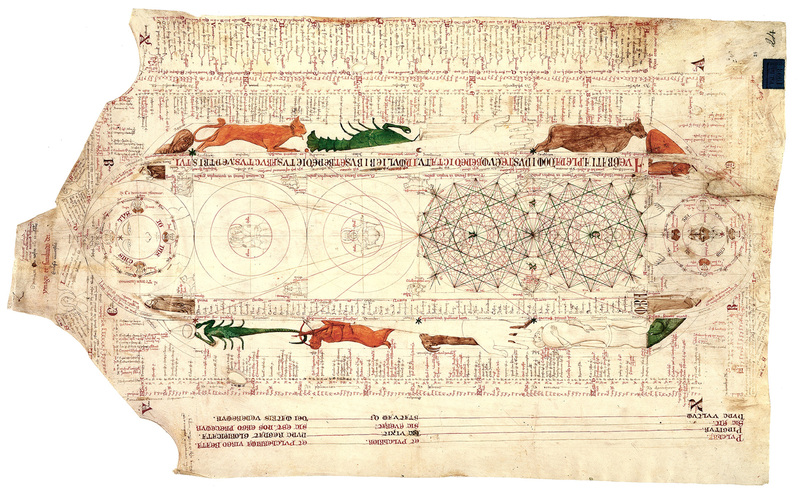 Byrhtferth’s digram is a visual meditation on the cosmic and religious resonances of computus, its subject the harmony of the twelve months and four elements, of time and the material world. 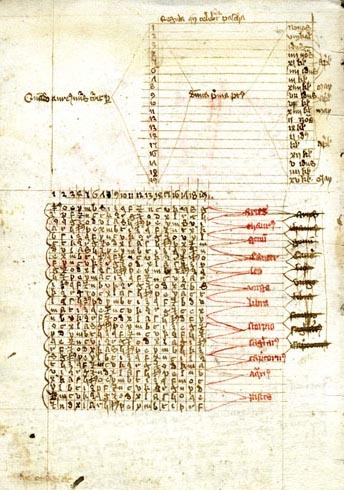 The tables on the opposite page show a series of diagrams used for determining lunar cycles, days of the week, and divination diagrams based on numerical values assigned to the letters. This highly colorful and complicated folio coordinates a vast amount of information, far more than any of Opicinus’s other drawings. It includes more than twenty separate sets of content, including the prophets, symbols of the zodiac, doctors of the Church, four monastic orders, the months, days, an implied world map, the genealogy of Mary, personifications of the Church, the gifts of the Holy Spirit, the four types of Biblical exegesis, the four Evangelists, the apostles, and the names of the letters of Paul. Opicinus clearly intended the drawing to be complicated and to require extensive meditation and exegesis. 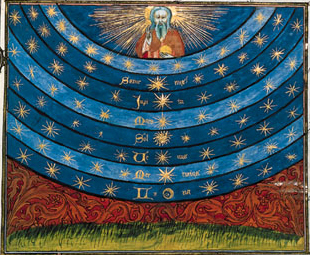 He made use of the medieval diagrammatic tradition in order to probe the connections between the cosmic, earthly, and the corporeal. 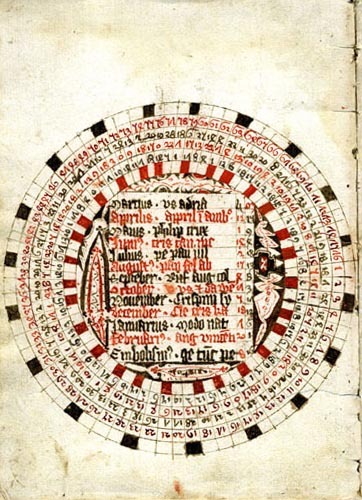 This interesting manuscript contains the tables and computational data for the calculation of Easter and other major movable and immovable feast days throughout the calendar year. It employs several methods of calculation to ensure the proper calculation of Easter given the variants of the Julian calendar and the problems of astronomical calculation prior to the scientific revolution of the sixteenth century. 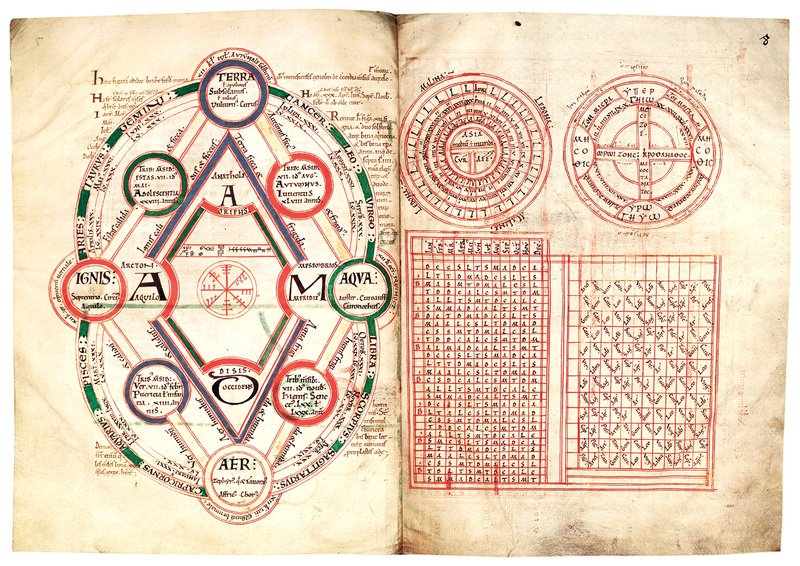 This calendar show the development of the precision in calculating Easter with the incorporation of the Arabic numerals and astronomical treatises brought into circulation in Europe from the eleventh century onward. The increasing inaccuracy of the lunar tables established by the Venerable Bede was noted in the later Middle Ages to be increasingly problematic. In this calendar, golden numbers are assigned to other days, falling four days earlier than the earlier Bedean tables, which this author does not use. 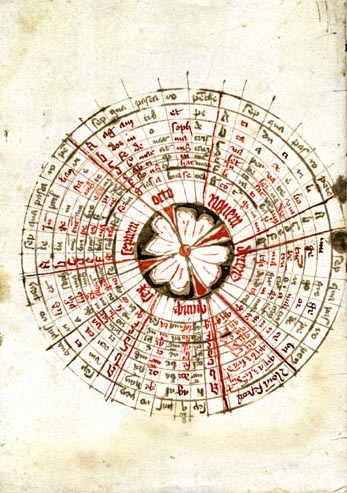 The calendar tables in this manuscript are designed to function on several temporal levels, from the specific calculations of Easter for the years 1400-1440 on f. 74, to the nineteen-year metonic and 72-year cycles found on f. 3v. Attention is paid to the importance of leap year in the table found on f. 2r and f. 3v. 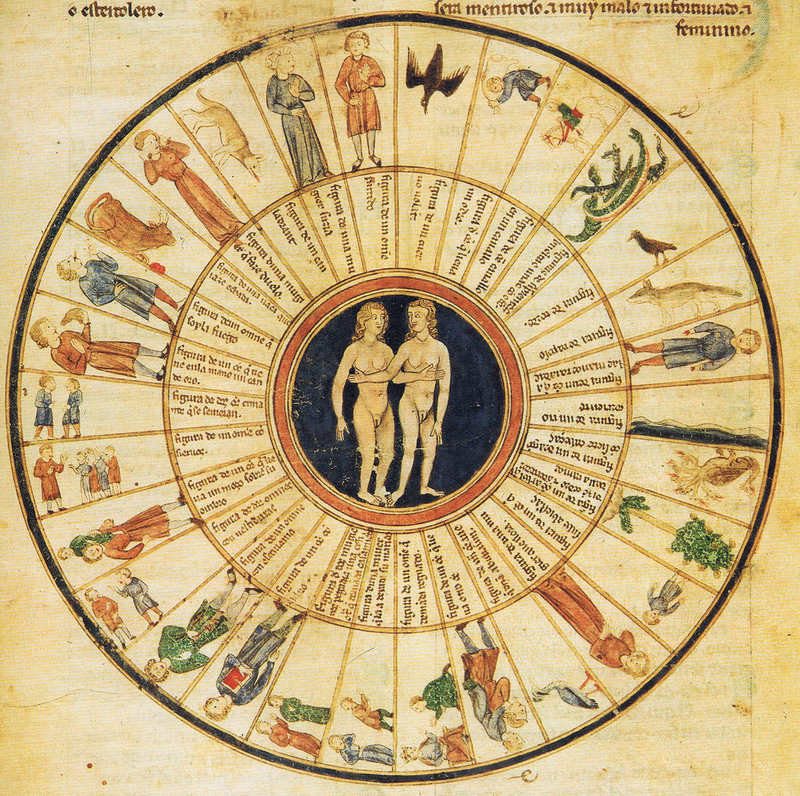 Throughout the manuscript, the author uses solar and lunar cycles in conjunction with the positions of the astrological signs corresponding to each month. One interesting feature is the incorporation of the zodiac with the position of the moon on f. 7v to determine whether or not actions taken during this period would be good or bad as they are attached to the twelve signs. 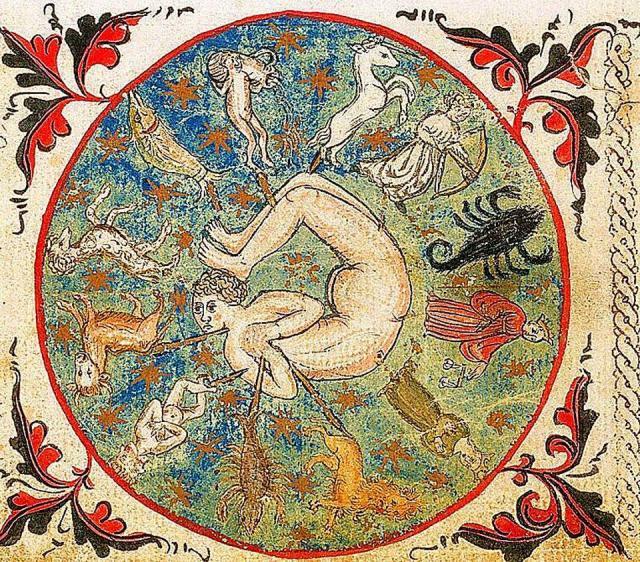 Illustration from a medieval Spanish language astrology textbook attributed to Alfonso X the Wise. The image is meant to depict the effect various other stars or constellations have in concert with Gemini.